This product was given to me by Vapefly for the purposes of this review and has been tested over a couple of months of regular use. Firstly, here are some photos. The Pixie is 22mm single-coil RDA with single-sided airflow, changeable airflow plugs and a two-part top cap design. It’s around $17.50 on various Chinese websites. It comes with the standard accessories, coils, cotton, etc. How is to build on? This is hands-down the easiest atomizer I’ve ever built on – no dexterity or experienced is required to get the coil in place, the posts are easily accessible, and it doesn’t matter which way you wrap your coil. I’d seen previous reviews stating that you should use tweezers to change the airflow plugs, but I didn’t find that to be the case, there are small tabs on each plug which allow you to change them without using any tools. There is a notch to give you the allegedly ideal coil position (more on this later) and coils are easily trimmed from behind the posts. First build – I used the provided coil in the suggested position and while there was decent flavor, there was too much heat from the top-cap – this problem was exacerbated by the fact that while the most open airflow plug helped to keep things (a little) cool, the more restrictive (three hole) plug was smoother and more satisfying to use, however the flavor was evident, so it was obviously worth trying to get it working a little better. First thing I did to try and improve the situation was to try a few different coils and while I did manage to reduce the heat, this came with a reduction in flavor as well, so obviously not a great solution. As this obviously wasn’t working, I started playing with the coil position. First thing was to raise the coil – this improved the flavor but didn’t affect the heat much – so next I tried pushing the coil closer and further from the posts – finally, I settled on having it as close to the posts as possible – this is a great improvement – I get the keep the flavor without melting my lips. This is a versatile RDA – choose the coil to suit your style, tune it by adjusting the coil position and you are rewarded with great flavor – not the best flavor ever but still very good. I’ve done well with the supplied coil, fused clapton and single core 26g and 28g claptons. Although you could fit a huge build in there, I didn’t find any advantage going over 3.0mm. drip-tip – it only comes with one and I found it was holding back the RDA, for low watt builds I swapped it out with the tip from the Galaxies RDTA and for higher watt builds I swapped it for the open bore tip from the Damn Vape Fresia RTA. airflow plugs – I didn’t get along with the less restrictive airflow plug, a plug somewhere between the supplied two might have been perfect. First a good thing: – it’s very easy to squonk on without leaking, it has a reasonably deep well, and being single side airflow, you can tilt the mod away from the airflow and pretty much squonk to the top of the posts. Now a not so good thing: – the squonk pin is raised which means the well has juice swilling around, and given the relatively low profile this results in you getting a mouth full of juice if you’re not careful. I partially solved this by putting a slightly longer wick than usual to soak up as much juice as possible, this takes away most of the problem. As far as 22mm RDAs go, this is much better for dripping than most. Ignore the height of the deck (which isn’t that bad) but look at how deep it is with the lower part of the top-cap. You aren’t realistically going to drip through the 510 tip, and while you could remove the drip-tip, the sensible choice is to remove the top section to drip. Yeah, it’s very usable as a dripper. I only use regulated mods, I will leave this issue up to people more qualified than me to judge. Works well as both a drip and squonk RDA. Coil placement needs to be good or you’re going to get toasty. Needs careful wicking or careful dripping/squonking to avoid drinking juice. (at least) one more drip-tip and one more airflow plug would have been nice. While the flavor is good, it doesn't offer the absolute best flavor out there. Would I recommend this RDA? Yes, absolutely – it’s cheap and offers a lot of options, most of which are good. 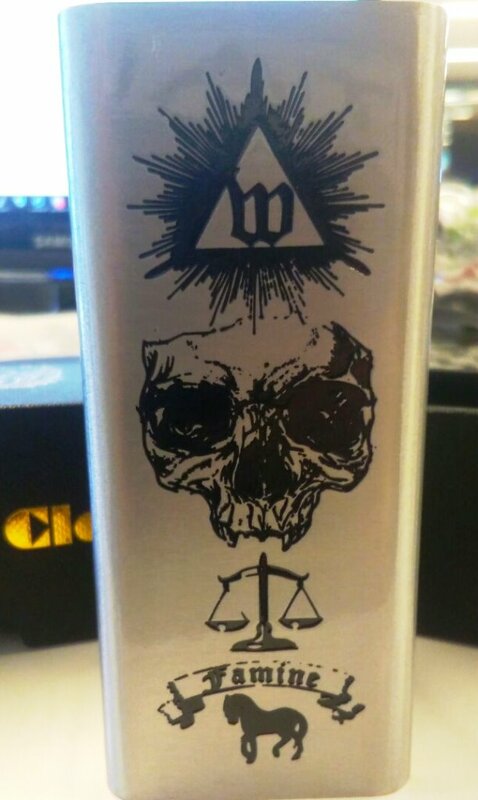 Would I recommend this RDA to a beginner? Yeah, sure – it doesn’t require any major technical skills and is something easy to learn on, just don’t expect it to be perfect the first time you build it. Would I recommend this RDA to someone who wants the best flavor available? Nope, while it does give pretty decent flavor, there are better pure flavor options. This is a long term review of the Vapefly Pixie RDADisclaimerThis product was given to me by Vapefly for the purposes of this review and has been tested over a couple of months of regular use.IntroductionFirstly, here are some photos.The Pixie is 22mm single-coil RDA with single-sided airflow, changeable airflow plugs and a two-part top cap design.It’s around $17.50 on various Chinese websites.It comes with the standard accessories, coils, cotton, etc.How is to build on?This is hands-down the easiest atomizer I’ve ever built on – no dexterity or experienced is required to get the coil in place, the posts are easily accessible, and it doesn’t matter which way you wrap your coil.I’d seen previous reviews stating that you should use tweezers to change the airflow plugs, but I didn’t find that to be the case, there are small tabs on each plug which allow you to change them without using any tools.There is a notch to give you the allegedly ideal coil position (more on this later) and coils are easily trimmed from behind the posts.PerformanceFirst build – I used the provided coil in the suggested position and while there was decent flavor, there was too much heat from the top-cap – this problem was exacerbated by the fact that while the most open airflow plug helped to keep things (a little) cool, the more restrictive (three hole) plug was smoother and more satisfying to use, however the flavor was evident, so it was obviously worth trying to get it working a little better.First thing I did to try and improve the situation was to try a few different coils and while I did manage to reduce the heat, this came with a reduction in flavor as well, so obviously not a great solution.As this obviously wasn’t working, I started playing with the coil position. First thing was to raise the coil – this improved the flavor but didn’t affect the heat much – so next I tried pushing the coil closer and further from the posts – finally, I settled on having it as close to the posts as possible – this is a great improvement – I get the keep the flavor without melting my lips.This is a versatile RDA – choose the coil to suit your style, tune it by adjusting the coil position and you are rewarded with great flavor – not the best flavor ever but still very good.I’ve done well with the supplied coil, fused clapton and single core 26g and 28g claptons. Although you could fit a huge build in there, I didn’t find any advantage going over 3.0mm.There are two areas which required improvement – one is fixable, one isn’t:drip-tip – it only comes with one and I found it was holding back the RDA, for low watt builds I swapped it out with the tip from the Galaxies RDTA and for higher watt builds I swapped it for the open bore tip from the Damn Vape Fresia RTA.airflow plugs – I didn’t get along with the less restrictive airflow plug, a plug somewhere between the supplied two might have been perfect.Squonking and DrippingFirst a good thing: – it’s very easy to squonk on without leaking, it has a reasonably deep well, and being single side airflow, you can tilt the mod away from the airflow and pretty much squonk to the top of the posts.Now a not so good thing: – the squonk pin is raised which means the well has juice swilling around, and given the relatively low profile this results in you getting a mouth full of juice if you’re not careful. I partially solved this by putting a slightly longer wick than usual to soak up as much juice as possible, this takes away most of the problem.As far as 22mm RDAs go, this is much better for dripping than most. Ignore the height of the deck (which isn’t that bad) but look at how deep it is with the lower part of the top-cap. You aren’t realistically going to drip through the 510 tip, and while you could remove the drip-tip, the sensible choice is to remove the top section to drip. Yeah, it’s very usable as a dripper.Mech SafetyI only use regulated mods, I will leave this issue up to people more qualified than me to judge.ProsVery easy build deck.Not picky with coils.Hasn’t leaked yet.Good flavor.Excellent value.Works well as both a drip and squonk RDA.ConsCoil placement needs to be good or you’re going to get toasty.Needs careful wicking or careful dripping/squonking to avoid drinking juice. (at least) one more drip-tip and one more airflow plug would have been nice.While the flavor is good, it doesn’t offer the absolute best flavor out there.ConclusionWould I recommend this RDA? Yes, absolutely – it’s cheap and offers a lot of options, most of which are good.Would I recommend this RDA to a beginner? Yeah, sure – it doesn’t require any major technical skills and is something easy to learn on, just don’t expect it to be perfect the first time you build it.Would I recommend this RDA to someone who wants the best flavor available? Nope, while it does give pretty decent flavor, there are better pure flavor options.